Museum at Warm Springs hosts exhibit of treaty that formed Warm Springs Reservation. 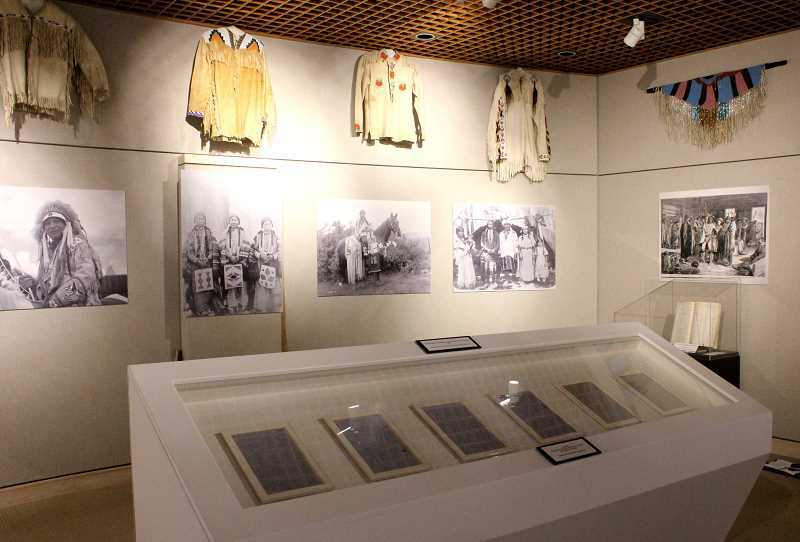 Six original pages from the treaty that established the Warm Springs Reservation are on display at the Museum at Warm Springs, through Nov. 2, as the highlight of its "Memory of the Land: Treaty of the Middle Columbia River Tribes and Bands" exhibit. The treaty pages are on loan from the National Archives in Washington, D.C., and were selected by museum archivist and Warm Springs tribal member Evaline Patt. The exhibit is intended to educate the public about the treaty, and is part of several programs celebrating the museum's 25th anniversary. One of the treaty signers, Sim-tus-tus, is an ancestor of Patt. "My father was Amos Sim-tus-tus Sr., and his father was Johnny Sim-tus-tus, and the others just went by Sim-tus-tus," she said. In order to exhibit the treaty documents, museum director Carol Leone said they had to build a special humidity controlled display case and provide a guard to watch over the documents and make sure no one takes photos of them, as camera flashes can deteriorate the documents. In 1855, leaders of the Warm Springs (Walla Walla) and Wasco tribes negotiated with the U.S. government on a treaty. In what was called the Treaty of the Middle Columbia River Tribes and Bands, the tribes ceded 10 million acres of land to the U.S., opening it for ownership by homesteaders, and agreed to move to an area which became the Warm Springs Reservation. They retained the rights to hunt, fish and gather roots and berries on the ceded lands. In 1879, the U.S. government also moved a group of Paiute tribal members to the Warm Springs Reservation. The three groups became the Confederated Tribes of Warm Springs, which now has an enrolled membership of 5,289 members from the Warm Springs, Wasco and Paiute tribes. While there are no photos of the treaty signers, the exhibit includes large photos of early-day tribal members, which were obtained from the National Archives. Other vintage museum photos, beaded bags, woven baskets, and headdresses are also included in the exhibit. One wall has large printouts of the transcripts of the actual treaty negotiations. Called the Wasco Council Proceedings, the transcripts include comments from Gen. Joel Palmer, Mark Chinook William Chinook, Sim-tus-tus, Kuckup, Locks-quissa, Stocketly, Alexsee, Foyet, Cush Kella, Yise and Iso. Leone said the Wasco Council was attended by some 500 tribal people, including tribal leaders and their families. "The tribal folks were experienced traders and got a considerable amount in the treaty, even though they gave things up," Leone commented of a time when the flow of pioneers into the area was inevitable. The National Archives holds in trust hundreds of original Indian treaties on behalf of the U.S. government, and is in the process of digitizing and placing the treaties online to make them accessible to the public.